Homestead Farm is a Registered Egg Grading Station located just 1 km away from the Holland Marsh. Pat Flack and her family have been in the egg business for over 30 years. They started grading eggs in 1978 as grader-producers and in 1986, opened the doors to their Registered Egg Grading Station. By law, all eggs sold at retail must be graded by a federally inspected Egg Grader. There are approximately 66 egg grading stations in Ontario. At Homestead, each farmer’s eggs are processed one at a time, as all eggs must be accounted for to the Egg Farmers of Ontario and the farmer. 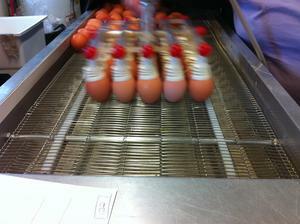 Eggs are gently moved onto a conveyer belt by a gizmo that looks worthy of Dr. Seuss. Six women, who work quickly and with tremendous focus, manage the whole operation. The eggs move into the darkened candling “room” where they roll over a bright light to reveal any cracks, blood spots, meat spots, rot, or poor quality yolk etc… By rolling the eggs as they pass over the candling light, the entire outer surface of the egg can be seen by the grader and makes even the most invisible crack visible. It also allows dirt, stains, or excessively rough shelled eggs to be seen. 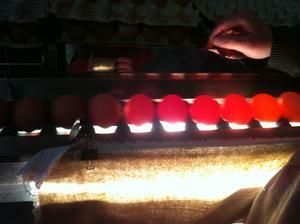 By this process the grader can determine whether each egg meets the grade requirements for Canada Grade A. The eggs that pass inspection are then cleaned with sprayers and brushes before being weighed and sorted into medium, large and extra large and hand-packed into cardboard boxes. The eggs travel from nest box to grocery store in 4-7 days. 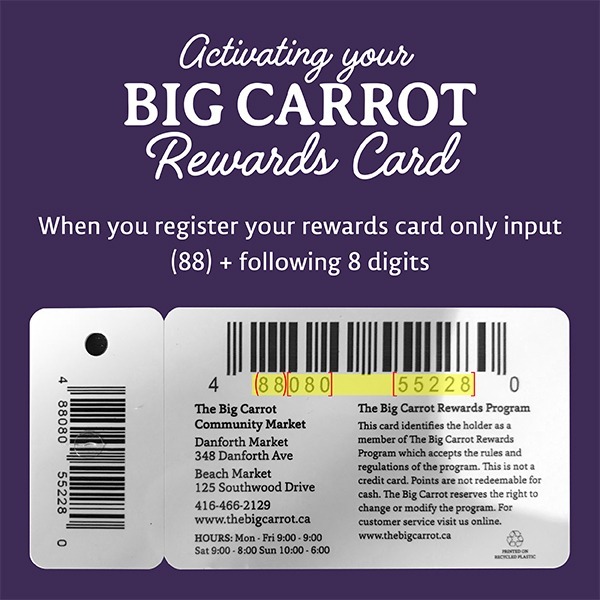 The Big Carrot sells only shell eggs from cage free hens. All Big Carrot deli dishes, juice bar sandwiches and bakery products are made exclusively with organic eggs that are naturally cage-free. 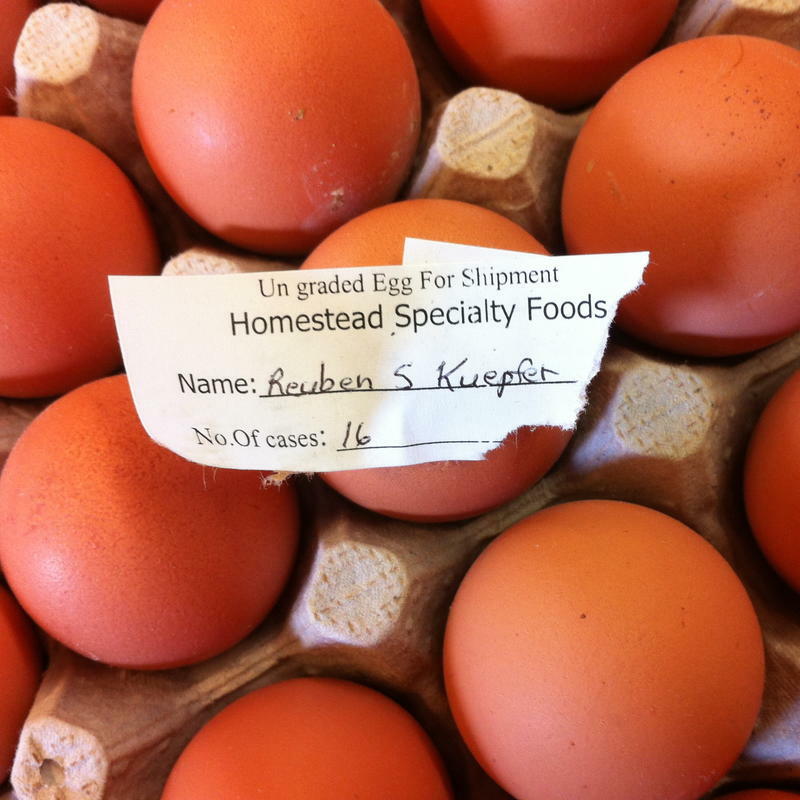 In the egg case we offer organic, pastured and free run eggs. The vast majority of these free run eggs come from Pat’s 40 farms. These “floor birds” as they are called in the egg world are housed together on barn floors, with food and water provided at stations throughout the barn. The hens lay their eggs in nest boxes to easily collect the eggs. Egg Farmer’s of Ontario annually inspects all egg farmers. Homestead recently acquired their organic certification to process organic eggs in addition to their line of free run eggs. They are looking to expand into the organic market but for now are only producing organic eggs for a CSA in Eastern Ontario. Click here for a short video of the eggs being sorted by weight!